Interviewer’s intro: Scott McIntosh admits to being a little old-school. He graduated with bachelor’s degrees in newspaper journalism from the Newhouse School at Syracuse University and English textual studies from Syracuse’s College of Arts and Sciences. He is a new member of the Idaho Press Club board, but he is not new to Idaho. He and his wife Nicola bought the Kuna Melba News in 2006 and became its publishers. 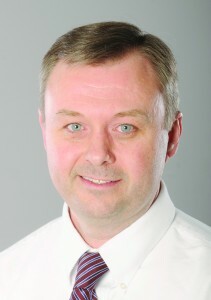 He became the editor of the Idaho Press-Tribune in Nampa in February 2014. Where have you worked? My first newspaper job out of college was at the Current-Argus in Carlsbad, New Mexico. From there, I went to the News-Herald in Willoughby, Ohio. After that, it was the San Mateo County Times in San Mateo, California. Then it was the Democrat & Chronicle in Rochester, New York. We then purchased the Kuna Melba News, which we sold in 2011. I took some time off before becoming the editor of the Argus Observer in Ontario, Oregon, in October 2012. I started as the editor of the Idaho Press-Tribune in Nampa in February. How did you decide to apply for your current job? It was quite a surprise to hear that managing editor Vickie Holbrook was leaving the Idaho Press-Tribune after more than 34 years. The opportunity to become the editor here was too great to pass by. We’ve been subscribers since moving to the Treasure Valley, and I’ve loved watching the paper change and evolve over the past couple of years. The Press-Tribune’s partnership with the American Press Institute in developing new content strategies for the paper really attracted me to the job. What do you like or dislike about working in print journalism? First and foremost, I love reading a newspaper every day. I love the experience of learning new things and having all that information packaged neatly for me in a concise yet in-depth format that’s delivered to my front doorstep like a Christmas present every morning. I still believe in the mission of print journalism of being a local government watchdog and providing local news coverage that no one else covers and no one else covers with as much depth and detail. As far as what I dislike, it’s been painful to watch advertising revenue decline and the cuts that have been associated with it. The biggest source of stress for me is not being able to fulfill functions that I believe newspapers should fulfill because we don’t have the same number of reporters and editors we used to have. What is the most memorable story you have covered? I wrote what started out as a short little story about a family who was in a serious car accident at the intersection of Columbia and Meridian roads in Kuna just before Thanksgiving in 2007. One family member, a Kuna High School freshman, ended up in a coma. I started researching the intersection and discovered that every day as many as 5,000 vehicles used the unsignaled intersection as an entry or exit point for Meridian Road, where the speed limit was 55 mph. I reported on the number of accidents at the intersection, and I also discovered the intersection had the highest danger rating for any intersection in Ada County but had the lowest “local support” score because it was outside Kuna and Meridian city limits in unincorporated Ada County. Because of that, signalization of the intersection continued to be pushed back year after year on ACHD’s five-year work plan while other intersections leapfrogged it. After my reporting, ACHD commissioners agreed to fund signalization of the intersection in 2009. Shortly thereafter, right before Christmas, the parents of the girl who was injured in the accident called me and agreed to do an interview, reporting that their daughter had nearly fully recovered from her traumatic brain injury. They called her their “Christmas miracle,” which became my headline for the final story in that series. I like to think that had it not been for my stories, signalization of the intersection would have been further delayed, resulting in more accidents, possibly a fatality. Who is the most interesting person you’ve interviewed? I’d have to say Jayden Bennett, of Kuna, who was 9 years old when I interviewed him the first time about his battle with osteosarcoma. He had just been diagnosed with the bone cancer, and when I went to his house, he was taking a bath and screaming in agony from the pain. After a few minutes, he came out and cheerfully talked to me and even played the piano for me. Over the next three years, that exemplified how he handled his battle. He always seemed to bounce back time and again, despite the odds. So many times, I would see Jayden after a surgery to remove tumors or a brutal round of chemotherapy or the surgery to amputate his leg, and think that he didn’t have long to live. Then, a couple of months later, I would see him riding his bike, one-legged, through the streets of Kuna or at a high school basketball game or dressed in an Air National Guard uniform flying in the front seat of a helicopter. The last time I interviewed him, he was using a crutch, but as soon as I arrived, he threw it on the floor and hopped out the door, insisting I take photos of him bouncing on his trampoline. Jayden’s happy-go-lucky attitude and his seemingly endless ability to bounce back were breathtaking. His grandmother told me that Jayden was the one who had to tell his dad that it was OK for the doctors to amputate his leg. I can’t say I know of any other 9-year-olds who could have held up so well as Jayden. Which do you like better, editing or reporting? The great joy of reporting is discovery. I love finding things out, crunching numbers, interviewing people, doing research. The hardest part of reporting is doing all that legwork. What’s nice about being an editor is that you get to tell someone else to go out and do all that work. The hardest part of being an editor is that the reporter never quite does it the way you would do it. They don’t ask the same questions you would ask, they don’t ask them the same way, they don’t write the story quite the way you would have done it. Sometimes, it’s better than you would have done it, and that’s an editor’s greatest joy. Overall, I prefer being an editor because I also enjoy teaching, managing and organizing a newsroom to be highly efficient and successful. But I still get the urge to go out and get a scoop. What is the biggest challenge facing print journalism? Declining ad revenue. I think our product, our content, what newspapers do, the types of stories we write, are still very important and needed in our society. The question is whether the business model that sustains that practice will continue to exist. Why do you hold staff “movie nights?” It’s something I started when I was a managing editor in San Mateo. We did it then because we had a fun group of reporters who wanted to hang out together and watch newspaper movies. I started movie nights at the Press-Tribune because I want to instill in our young reporters the sense that they are part of a long and rich — and important — history of shoe-leather journalism. We started with “All the President’s Men,” and I hope it showed them that what we do on a daily basis isn’t that much different from what Woodward and Bernstein did 40 years ago. They just did it without computers, cell phones or the Internet. What is your favorite movie? I have a lot of “favorite” movies, but The Big Sleep is a movie that I can still watch over and over again and not get sick of. Tell us about your family… My wife, Nicola, is the communications officer for Zions Bank in Idaho. Even though we went to Syracuse University together and actually took a graphics design class together, we didn’t really meet until we worked at the Current-Argus newspaper in Carlsbad, New Mexico. She’s been a newspaper reporter, trade magazine reporter, newsletter reporter and editor, website editor, stay-at-home mom and publisher of the Kuna Melba News. We’re celebrating our 17th wedding anniversary on May 31. We have two sons, Luke, 12, and Robert, 9, who attend St. Joe’s Catholic School in Boise. What do you hope to accomplish on the Idaho Press Club board? I want to help support the Press Club’s efforts to fight for open government and do what I can to help continue and expand the Press Club’s offerings of events, legislative meetings and seminars, which I think benefit all journalists in Idaho.